The old Dufferin Gates of the Canadian National; Exhibition on November 16, 1942. Toronto Archives, Series 372, S0372, Item 1659. Although the Canadian National Exhibition has somewhat lost its importance as a late-summer event in Toronto, it remains the largest fair in Canada. Each year it attracts over a million visitors during the two-weeks it is open. When it began in 1879, it was mainly an agricultural exhibition that also showcased the latest industrial developments. During the decades ahead, it continued to feature the latest technological advancements. 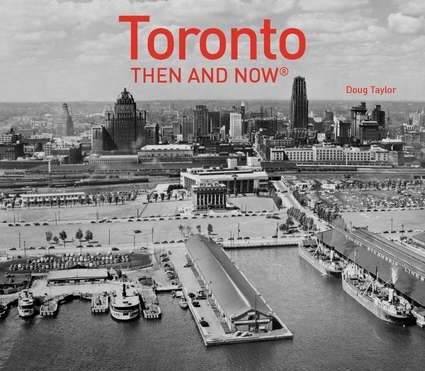 The first electric streetcars and trolley cars, sound recordings, radios, electric refrigerators and television are but a few of the inventions that were introduced to Toronto at the CNE. When the fair was inaugurated in the 19th century, its main entrance was through a simple gate with a turnstile, located at the foot of Dufferin Street, south of Springhurst Avenue. The impressive Princes’ Gates of today did not yet exist. In 1895, a proper wooden structure was built, with an archway entrance and buildings on either side of it. In 1910, these gates were demolished and new ones built. The designs were created by George W. Gouinlock, who had been the architect of the Horticultural Building in 1907, which is now the Muzik Nightclub. In 1912 he was to design the Arts and Crafts Building, now the site of Medieval Times, and also the CNE Fire Hall and Police Station that remain in use today. Gouinlock’s gate of 1910 was grand and fanciful. It created the impression that the moment visitors arrived in front of them, their wondrous experience of attending the fair commenced. People arrived at the Dufferin Gates via a streetcar line on Dufferin Street and a railway station nearby. Gouinlock’s Dufferin Gates consisted two tall towers composed of metal and brick, designed in the Beaux-Arts style, with a wrought iron structure that connected the two towers. At the base, between the two towers, was the actual gate where visitors entered. In front of it was a semi-circular forecourt that resembled a grand plaza. The forecourt and the buildings on either side of the towers funnelled crowds toward the gates. The buildings on either side of the gates possessed fanciful Baroque-style domes. Inside the buildings were display spaces used for exhibits when the fair was in operation. When the gates opened in 1910, from inside the gates, visitors gazed southward to a wide avenue that terminated at the lake. The avenue was flanked by mature trees, with new exhibition building on either side of it. The Dufferin Gates reflected an era of optimism, when people believed that science and technology were advancing so rapidly that almost anything was possible. The gates were flamboyant, theatrical and overblown, akin to modern extravaganzas created by rock and pop stars as they light-up stages with pyrotechnics. In this respect, the era of the Dufferin Gates was similar to the world of today. The year 1927 was a special year for Canada as it was the 60th anniversary of Confederation. To honour the event, at the eastern side of the CNE, the Princes’ Gates were opened by the Prince of Wales (later King Edward VIII). The Dufferin Gates now ceased to be the main entrance to the fair. However, for the next five decades, they continued to serve as an entrance for those approaching the grounds from the northwest. I was unable to discover the year that the ornate buildings on either side of the gates were demolished. They appear in the 1937 photo, but not in the photo taken in 1953. Personally, I do not remember these fancy buildings. The Dufferin Gates in 1908, which had been built in 1895 to replace the simple wooden structure. Toronto Archives, F1244, Item 0272. Night photo of the Dufferin Gates in 1908. Toronto Archives, F1244, Item 0272. Troops departing through the Dufferin Gates in 1914, Toronto Archives, F1244, Item 0779. The Dufferin Gates in 1915, when the grounds were used as a military camp during World War 1. Toronto Public Library, r – 4096. The gates in 1927, when they were decorated to celebrate the 60th anniversary of Confederation. Toronto Public Library, r- 4095. The Dufferin Gates designed by George Gouinlock, photo taken in 1928. Toronto Archives F1244, Item 2019. The Dufferin Gates in 1932, Toronto Public Library, r- 3432. Looking south toward the Dufferin Gates on July 15, 1937. Toronto Archives, F1231, Item 1446. View from inside the gates in 1953, Photo from the collection of the Toronto Public Library, r-3198. Photo from a 35mm slide of the Dufferin Gates, taken by the author in 1956. Demolition of the Dufferin Gates in 1958, Toronto Archives F1244, Item 2022. Construction of the new Dufferin Gates in 1959, Toronto Archives, S0065, Fl.0058, Item 0008. The Dufferin Gates between 1978-1987, Toronto Archives, S1485, Fl 0363, Item 0011. The Dufferin Gates in March 2016, view from the southeast. Thanks for writing such a fascinating piece on the CNE. One of the best I’ve seen anywhere.